CaptEV is a pre-enrichement reagent that concentrates all extracellular vesicules of cell culture supernatant to ensure optimal isolation and purification of exosomes. Exosomes are small extracellular vesicules of 30-100 nm constitutively released under certain stimuli in biological fluids including blood, urine, saliva, breast milk, culture medium of cell cultures, etc. Exosomes contain various molecular constituents of their cell of origin, including proteins and microRNA. Circulant exosomes can potentially act as cargo messenger and transfer molecules from one cell to another via membrane vesicle trafficking. Exosomes are suitable for a variety of downstream applications including RNA analysis, protein analysis and functional use. 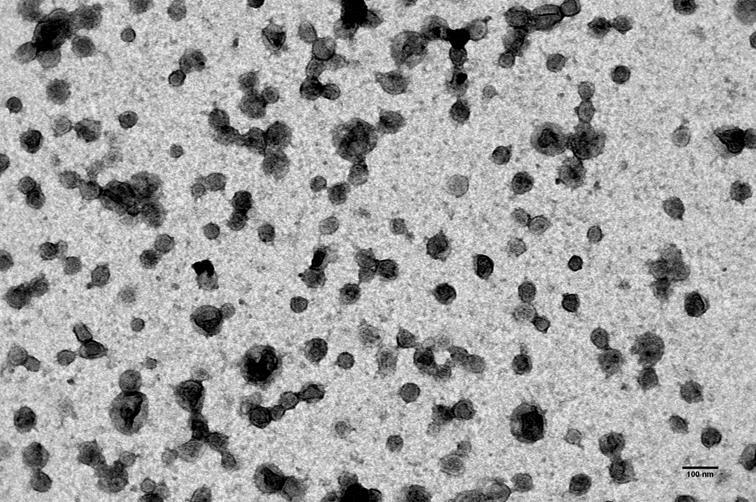 TEM picture confirms the highly pure exosome preparations from HeLa Cell culture medium by showing clean exosomes in the samples. ExoIP anti-CD81 kit was used with elution of beads and Diagenode CaptEV reagent as a pre-enrichment tool. 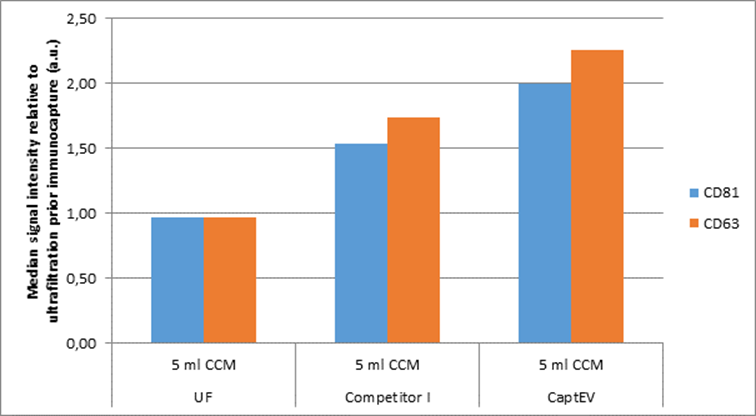 Median signal intensity from the flow cytometry analysis of the exosome capture efficiency corresponding to different pre-enrichment ways prior immunocapture (ExoIP™). Diagenode strongly recommends using this:	CaptEV cell culture (Diagenode Cat# C28030001-10). Click here to copy to clipboard.